Description of "How to Hypnotize Someone Easily (eBook)"
Hypnotherapy is a way to help people overcome their own shortcomings, doubts, and fears to be better people. With hypnosis you can help people get over fears and phobias, allowing them to lead a less anxious and fearful life. You will have the tools necessary to help overcome bad habits, even lifelong habits like smoking. Hypnosis is easier to learn than you might think and in this simple book we have it all spelled out for you from how to explain what to expect from the session to your clients, how to induce them into the hypnotic state, how to deepen the hypnotic state, how to tailor the script for each client and then how to end the session. By the time you are done with the book you will be ready to begin practicing your new abilities. Isabelle became interested in learning about hypnosis after using hypnosis to help her stop smoking. She was so fascinated by how well it worked and how simple that it seemed to be that she made a study of it and has been practicing hypnosis for the past twenty years. 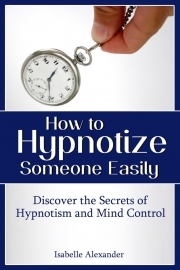 Reviews of "How to Hypnotize Someone Easily (eBook)"